The most credible form of advertising comes straight from the people we know and trust. Consumers value recommendation above all else when making purchasing decisions. It's no surprise then that influencer marketing, in which focus is placed on powerful individuals who have influence over potential customers and whose opinion is trusted by a large number of people, has been around since the 1900s. © Eaters Collective via Unsplash.com. Influencers have reach, contextual credibility and salesmanship. It’s a trend that was popularised by the movies, which also meant it was available only to big businesses that had the money to pay celebrities. Back in the 50s, star of the Golden Age of Hollywood Joan Crawford endorsed Camel cigarettes and still today, the Macallan whisky is known to be James Bond’s preferred brand. In the 90s, Pamela Anderson, Naomi Campbell and Elle Macpherson were paid to work with brands and were on billboards, in magazine advertorials and on TV. Simply, it works: influencer marketing campaigns boast some of the highest ROI metrics available to marketers today. But its effectiveness also means the price of entry can be exclusionary. Today, however, technology is levelling the playing fields. 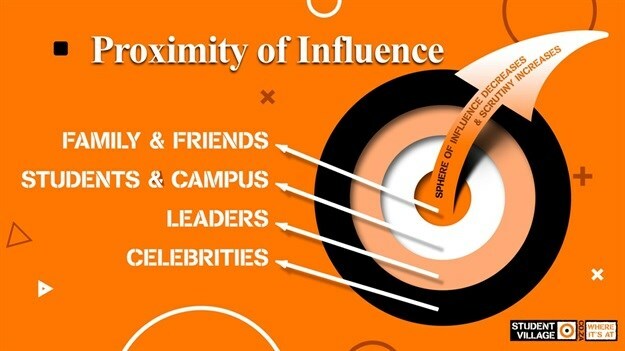 In a study that Student Village conducted in 2018, they asked students how they defined themselves and, while many preferred to avoid a label when pushed, most of them chose the term ‘influencer’. To be a student influencer, after all, all you need is a cell phone and a social media account. You don’t even need to have anything interesting to say. For example, I was recently blown away when I came across CashCats, (stylised as Ca$hcats), a single topic blog that curates user-submitted photographs of cats posing with piles of money. It has 159,000 followers. Marketers know that television advertising is no longer as effective as having your brand endorsed by an influencer. Getting the brand message promoted by a celebrity with a big following is seen as an easy win, a quick fix, a silver bullet for getting a product out there. As one of the hottest technologies in the marketing box, it has a pretty good track record, but influencer marketing has to be used properly to get the best results. And it’s not. What is wrong with social media influencers right now? Celebrities with a big following see their ability to influence consumers as an easy way to make money and they take on as many endorsements as possible. In the process, they lose credibility by overdoing it. Students call them ‘brand hos’ because they hop from brand to brand. The youth are hyper sceptical of paid endorsements and seek authenticity above all else. The Kendall Jenner Pepsi advert caused outrage because she has never been known to stand up for human rights or any type of social justice cause. It was clear that she was simply paid to star in the commercial. Zero authenticity put the campaign on the back foot before it even started, causing damage to the brand, and distrust among consumers. Influencers are a form of media and they are an advertising channel – much like Google and Facebook in the digital space, and magazines, television and radio in above-the-line advertising. They should be treated as a valued part of the marketing family. See them as you would a relationship. Meeting for quickies is hardly going to result in depth, trust and authenticity of feeling, is it? Involve them in conversations and brand discussions, invest in them through training, engagement and long-term relationship building, and see what result you get. Because they are a valued media channel, working with influencers requires a budget. Influencer marketing has become all about measurability and metrics. Yes, it is absolutely critical to ensure you know how to measure success and what your key performance indicators are. of the time. But depending on the goal of your campaign, whether it is brand awareness, sales conversions or something else, different metrics will apply in line with what is most relevant to help measure the success. We don’t know what works and what doesn’t. All we have available to us right now is the number of views and instances engagement. Granted it is better than a billboard where you are left to guess the results yielded, but it is still rudimentary if you think about it. It makes far better sense to first make sure your campaign strategy aligns with your core goals – to ensure that you are working to achieve your goals – before implementing an influencer marketing strategy. Then, you need to make sure that the reporting metrics are set up so your campaign can be tracked, measured and analysed. There is nothing worse than finishing a campaign and having the wrong reporting metrics. Carefully defined metrics will enable you to articulate what success looks like. Given these three issues, the question we should ask is, ‘Is influencer marketing here to stay?’ Well yes, because people influence people and that will never change. But an evolution is required. The concept that an influencer must have millions of followers to be valuable to a brand is misleading. Micro influencers are people that have a following which is smaller than that of celebrities, but they are much more believable because they are far more authentic. With followings of as low as between 5 000 and 10 000 people, they are sometimes 60% more effective than their celebrity counterparts. The reason is that young people trust those that are closest to them – friends and family are part of the inner circle of influence. The further an individual falls out of that circle, the less the influence they will have. This is where the LIP (Lust, Investment, Proximity) Model comes in. Lust: Influencers must have a strong desire for what they are endorsing. Find people who are passionate about your brand and they will fight to be on your team. They will recommend the brand naturally, as if it wasn’t a job, helping to take it to new heights. Investment: Investing in influencers is a long-term commitment. Training is a crucial element and the time spent on getting people to understand the brand vision, objectives, and product is crucial. Proximity: Consumers trust word of mouth and recommendations from friends and family; the closer the proximity of a trusted group, the higher the sphere of influence. When looking at university students, for example, peer groups have a higher influence on each other than other people. Not only that but as the sphere of influence expands outwards, the degree of trust drops and scrutiny rises. Authenticity plays a big factor and when it’s absent, the youth will be sure to let everyone know. Applying the LIP Model will help you choose people who love your brand, who you will make the effort to invest in, and who you will keep close. By influencing the people closest to them, they will build more trust. Micro influencers are brand advocates who have a deeply engaged, niche audience. They offer opinions that are deeply trusted by their followers, who are generally like-minded people looking for truth and legitimacy. Their passion for their niche area makes them powerful brand evangelists who are excellent at interacting with their followers. They have more conversations, and those conversations translate into action – the most important metric of all. Founder & Director at The Student Village.